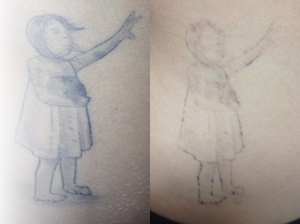 Laser tattoo removal has been proven to be the most efficient, safest and effective way to remove tattoos. 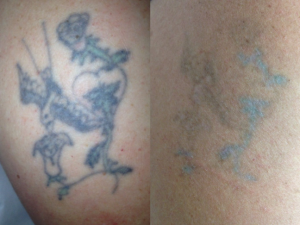 Q switched lasers came out in the 1980s and gave the best results for laser tattoo removal. The laser emits fast pulses of light which break up the ink particles underneath the skin in the dermis layer. Your body will over time remove the broken ink through your lymphatic system this takes a period of 4-6 weeks. How old is your tattoo? A new tattoo will usually take longer to remove than an old tattoo. Was it done by a professional or an amateur? A professional tattooist is more likely to have bedded think in the dermis of your skin ( deeper) and more likely to have used more ink. Therefore more ink needs to be removed. As the saying goes ” there is nothing worse than a professional doing a bad tattoo” AN amateur tattoo is more likely to have less ink in it and be closer to the surface of the skin. This isnt always the truth but more than likely a amateur tattoo will be easier to remove than a professional tattoo. Your skin type? Better results are on fairer skinned people as the laser targets pigment, on dark skin or heavily tanned skin ( natural or fake) the laser needs to be set lower to reduce the risk of pigmentation it is safer option but can take longer. Its a good idea to keep the tattoo you want removed out of the sun. Your health? Your lymphatic system removes the broken up ink from your tattoo, for your body to remove ink faster and promote healing you need to be in good health. If you are pregnant or suffering from a major illness we recommend you wait until you are in good health, or not pregnant or breast feeding to get your tattoo removed. How many colours are in your tattoo? Certain colours need different lasers, black and dark blue are usually the easiest colours to remove where as green and yellow can be the hardest. Our Q Switched Nd Yag laser has 2 settings which can remove most colours, some colours can take longer. Tattoo removal can take between 2-20 treatments it really depends on your tattoo and your skin type. The average time is 5-10 treatments. Remember tattoos were designed to be permanent, we are lucky we now have the technology to safely remove them. Does it Hurt? Some say it hurts the same as getting the tattoo on, others think more, or less. It depends on your pain threshold. We have numbing cream available for sale, after the test patch if you think you may need some pain relief. Numbing cream takes 2 hours to be effective so it needs to be pre purchased. This can be done at the first consultation test patch. Is laser Tattoo Removable Affordable? 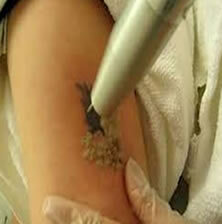 At Edit Laser Tattoo Removal our aim is to make tattoo removable more affordable. Tattoo removal can be expensive as it takes a number of treatments to remove the tattoo, that was designed to be permanent. The cost of the lasers are becoming less expensive but can range from $20000-$300000 or more. At Edit we offer layby where you can pay for your treatment at as little as $10 per week. We also offer Mac credit where you can apply for a loan ( minimum $5000 ) for larger procedures. If you pay all treatments upfront we will offer a generous discount. Please check our Facebook page for the latest specials. PAY UPFRONT for 3 Treatments the 4th treatment is HALF price. PAY UPFRONT For 5 Treatments The 6th Treatment is FREE. There are risks with any procedure, similar to getting your tattoo on, there can be a chance of infection if the tattoo isn’t looked after, by following after care procedures. blisters alone and not break them prematurely. The tattoo should scab up this is normal don’t remove the scabs as this could cause scarring just let them fall off when ready. after the treatment, this will give us an indication on how the treatment is going, and address any concerns you may have. Whats expected at appointment time. -Please turn up on time, if your are late please notify ia txt ( as I cant always answer or listen to vioce message in the treatment room, I can see a txt quicker. If you are more than 15 minutes late you may need to reschedule. -If you cannot make your appointment please give 2 hrs notice or a $30 fee can be charged at your next appointment. I do make allowances for emergencies however if a sudden cancellation occurs too often a fee will be charged. - Please do not bring children who need supervison to the appointment. Children can sit in reception area however the door will be unlocked and people can walk in and out. If this is an issue please reschedule. - If you are not good with pain and think you will need Numb cream, it needs to be applied at least 1 hr before ( or as per instructions) and kept covered so it works. -If you are sick please reschedule, as Tattoo removal requires a good immune system function if your immune system is down this increases infection risk. - Try to where clothing that give easier access to treatment area. Eg a short sleeve shirt for a forarm tattoo, shorts for a leg tattoo, Open shoes for a foot tattoo.